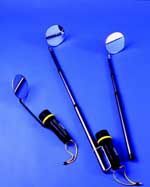 Including; parking aid mirrors and driveway mirrors, traffic safety mirrors, portable inspection mirrors, and lots more. 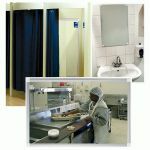 Our range includes security and safety mirrors for internal or external use, in a choice of styles, colours and types, including: unbreakable mirrors, round convex mirrors, hemisphere mirrors and anti frost and anti condensation mirrors and search and inspection mirrors and many others. 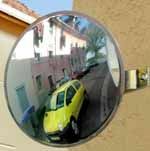 These unbreakable mirrors are designed for outdoor use and are typically positioned at the end of a driveway or at a site exit to eliminate blind spots and reduce the risk of accidents by providing the driver with a clear view of the approaching traffic on the road they will be joining. 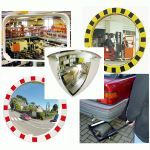 They also offer a low cost visual aid to help drivers parking a vehicle safely in tight or visually restricted spaces. 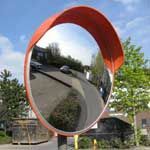 These unbreakable mirrors are designed specifically as a driver aid and will be found at busy road junctions, site entrances and exits and in fact almost anywhere else where a drivers view may be restricted in some way. These unbreakable mirrors feature high visibility black and yellow frames to draw the viewers attention to the mirror. 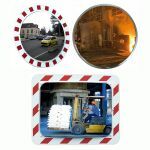 They are designed primarily to help reduce accidents in commercial and industrial premises. Typical uses include avoiding collisions between fork lift truck in busy warehouses, or between vehicles in goods yards, etc. 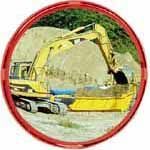 These mirrors are available in a range of styles and sizes, but are primarily designed to allow the user to easily view difficult to reach areas such as the topside or underside of vehicles, cramped speces such as behind boilers, into ceiling voids, etc. Over recent years they have become a key aid to the military, police forces and commercial security staff, who use them to search for bombs and explosives, drugs or contraband, stowaways and lots more in the fight against smuggling and terrorism. 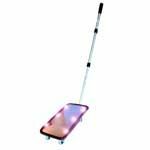 Some models such as our under vehicle search trolley mirrors feature wheels to reduce operator fatigue when used for extended periods whilst there are also compact foldup models designed to fit in the pocket. 1. What type of material is best? 2. What size mirror do I need? 3. What type of Type of mirror do I need? 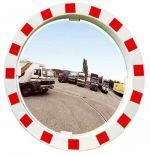 ... in fact, whatever type of security or safety mirror you need, you`ll find it here ... and at a great price. 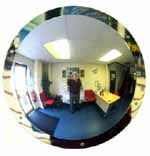 Note: Our Unbreakable Convex Safety & Security Mirrors represent the very latest in convex mirror technology. They are manufactured from a special unbreakable plastic material, offer crystal clear reflections and their thermal properties mean that they are less prone to frosting or condensation than other types of mirror. Can`t see what you want or need advice to help you make the right choice?